The microbial inhabitants of your gut have been shown to impact your brain, emotions and decision making. This idea snowballed after a study in 2003 looked at mice gut bacteria and found that mice raised in bacteria-free environments had different gene expression and had fewer hormone receptors within the brain. The ‘bacteria-free’ mice had notably higher levels of anxiety when compared to mice colonized with bacteria. We too are colonized by microorganisms both inside and out, in case you weren’t aware. The implications of this study are staggering, and super interesting. As research continued into the area aptly named the ‘gut-brain axis’, it was discovered that microbes and the molecules they produce play important roles in human brain development. This has been demonstrated in infants during pregnancy. Differing microbial compositions correlate with changes in gene expression levels involved in immunity pathways. 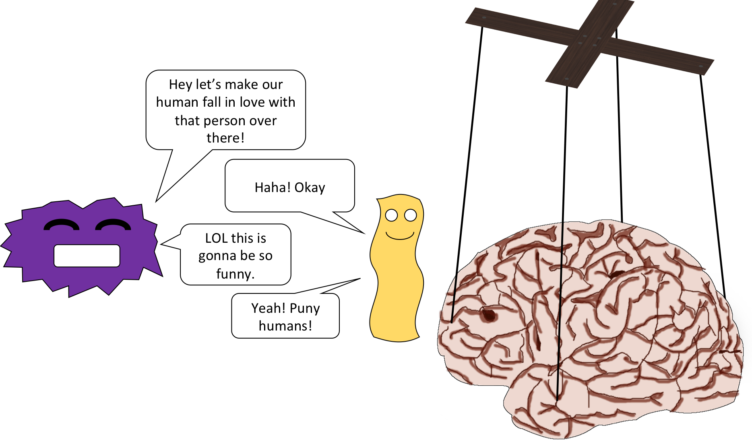 The implications of this relationship leads us to ask what potential impact microbes are playing in mental illness. If there are microbes that can impact our mental well-being, we can potentially treat people via displacement of unwanted organisms (antibiotics) or by introducing mentally beneficial microorganisms (psychobiotics). There have been several studies looking at the effectiveness of treating schizophrenia using antibiotics. A 2017 meta-study (a study which combined a whole bunch of suitable randomized controlled trials) found treatment with the antibiotic minocycline significantly reduced symptoms of schizophrenia. For a frame of reference, a meta-study of randomized controlled trials is the pinnacle of rigorous science and the closest we can get to the Truth. While there are many side effects of current antipsychotic medication used to treat schizophrenia, there was no statistical difference between the antibiotic treatment compared to the placebo control group. Besides the shortcomings of antibiotic therapy (#superbugs) being the main weakness of this approach, it provides interesting data regarding the role bacteria might play in symptoms of mental illness. Alternatively, the antibiotic could be playing a role in reducing inflammation or improving brain cell proteins as suggested by several studies. An interesting question would be to treat with different antibiotics, and see if similar or different results occur. Another meta-study looking at randomized controlled trials treating anxiety disorders using the antibiotic D-cycloserine found a significant reduction in symptoms, and found it had a moderate effect size (medium magnitude of effect). A more recent meta-study however, found a small effect size regarding D-cycloserine treatment but concluded that more rigorous studies are required. Interestingly, another recent meta-study which looked at randomized controlled trials where anxiety disorders (general anxiety disorder, social anxiety disorders, post-traumatic stress disorder, phobias, obsessive-compulsive disorder etc) were treated again with D-cycloserine. No difference between the placebo groups and the antibiotic-treated gropus was shown. They concluded the trials they looked at were too small and provided ‘low quality evidence’, so we don’t have enough information to draw a conclusion from yet. Autism is strongly associated with gut complications such as inflammatory bowel disorder. Some combinations of gut bacteria or dysbiosis are correlated with gut inflammation and inflammatory diseases. Autistic children have been found to have significantly higher incidence of gut complications when compared to non-autistic children. One group managed to find several genes that are correlated with both inflammatory bowel disorder and autism-spectrum disorder. So while autism is a multifactorial disorder, there seems to be a relationship between autism and the immune responses and colonisation of the gut. Lactobacillus plantarum PS128 has been implicated as a psychobiotic when given to mice. It has been shown to reduce some symptoms of anxiety. Another psychobiotic Lactobacillus rhamnosus JB-1 was given to mice, which also reduced anxious behaviour. However, when Lactobacillus rhamnosus JB-1 was given to healthy human males in a small eight week trial, there was no self-reported difference regarding mood, anxiety, stress or sleep quality compared to the placebo. It appears that much more work is on the horizon for this fledgling field. It is strange to think my microbiome may have influenced the decision to write this article on the microbiome’s influence on decision making. 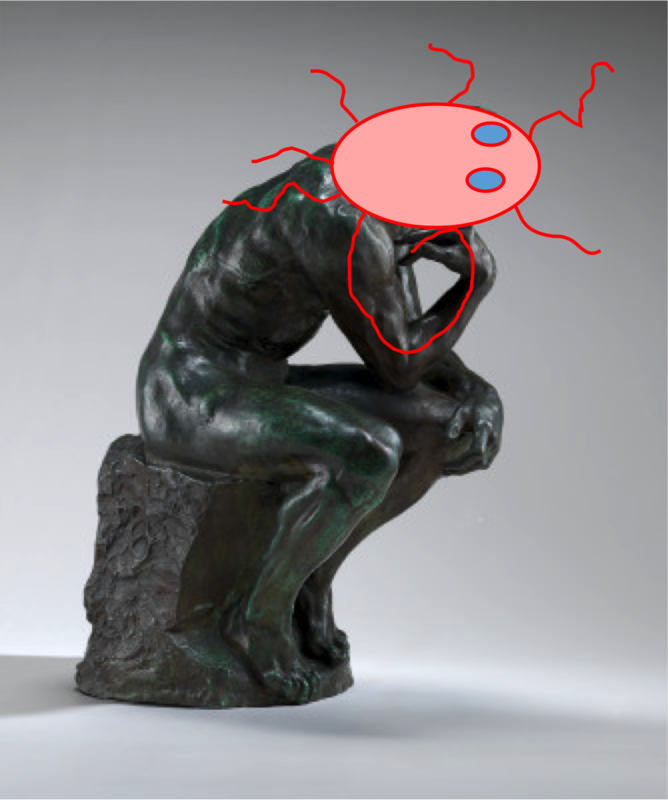 The Thinker, how we understand it as of now. The implication that our decision-making process is a net result of a complex web of organisms working in symbiotic harmony (or disharmony) challenges the thought that we aren’t single-minded organisms that make solitary decisions. This in itself is a mindrending rabbit hole of existential proportions which leads some to question the philosophical enigma of ‘self’. Are you beginning to wonder how much control ‘you’ actually have over your own decisions or beliefs? Can you look at human behaviour under a different ‘scope’ now? Is this you? We share the complex ecosystem that is ‘our’ body, with cohabiting microbial and macro-organisms, which in turn shape our self, not only physically, but mentally. Who am I, but a mix of my genetics, environment, and cohabiting microbes? At what point are these microbes not considered ‘my genetics’, if they make up part of who I am as a human? PhDer who works mainly with bacteria and computers.